OXFORD, England, April 4, 2019 /PRNewswire/ -- Tutors International, the leading provider of elite private tuition services worldwide, has today issued a public statement sharing its founder's views on the 2019 US college admissions bribery scheme. 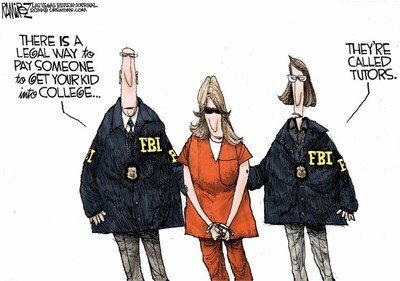 The FBI case, nicknamed Operation Varsity Blues, has revealed that wealthy families have paid bribes to secure elite school places for their under-qualified children. Adam Caller commented, "There is a legal way to use wealth to secure college entrances, and that is to employ highly skilled, elite private tutors who can customise an education to support each child's abilities and aspirations. In this particular case, which has caught the attention of the media and public worldwide, it's baffling as to why these wealthy celebrities and prominent businesspeople spent vast sums of money on such a risky venture. If they had invested in a private tutor to tailor an education to meet their children's needs, they could have spent considerably less than the sums handed over in bribes, and enabled the children to enter college legitimately with the skills and knowledge required." Mr Caller added, "For anyone considering admissions bribery, perhaps because their child is struggling with school or doesn't look likely to meet the required grades, I would highly recommend recruiting an experienced tutor, even if this is on a short-term full-time basis or as a longer-term after-school arrangement. Whilst we cannot legally make guarantees around educational outcomes, our record at Tutors International is without gap: every child we have tutored has achieved the goals they set out to achieve. With the right instruction and the right timeframe, the chances that a child does not achieve his or her goals are negligible." Commenting on the need for individualised educational support today, Mr Caller remarked, "Our educational systems should be of a sufficient quality to ensure each student reaches their own educational apogee, but the reality falls short of this at present. Is it unfair that people with sufficient financial means can afford to subsidise or replace this education with private tuition? Perhaps, but it is for each family to choose how they spend their wealth, and investing it in their children's education and future is a smart manoeuvre – as long as the child is ultimately responsible for their examination results and academic success." Founded in 1999, Tutors International provides high-net-worth families with a bespoke tutoring service tailored to their specific needs and circumstances. It has offices in the UK, America, and Asia. To find out more about Tutors International and the elite services it provides, including full-time private tutors for families worldwide, visit www.tutors-international.com.